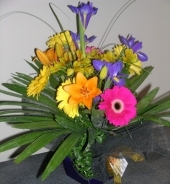 Bouquet of daisies, roses gentians and Gerberas. Wrapped for WOW factor. Available in three diffe.. Combination of seasonal delicious vibrant colour. A joy to receive, a joy to give. 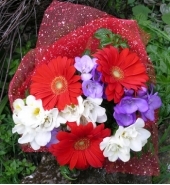 Hand tied ..
Give a gift of instant smiles -- half a dozen gorgeous Gerberas in vibrant assorted colors. 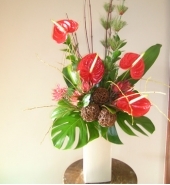 A tra..
Beautiful arrangement of cut flowers, including long lasting tropical flowers. Guaranteed to.. 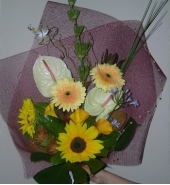 Flowers for success! Love the clean lines and upward movement of these beautiful tropical anthiri.. 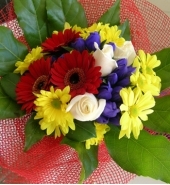 Combination of seasonal fresh flowers. Nice and bright. 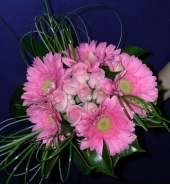 Roses, Gerberas, Daisies, Gentians w..
Website Designed & Hosted By 24/7 Hosting & Web Design | Copyright © 2012 - Petals on C | All Rights Reserved.